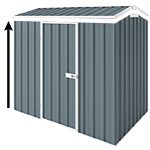 The EasyShed range represents fantastic value Australian made garden sheds which come with a wide range of customisable options. Looking for the perfect size garden shed or workshop? This EasyShed Workshop model is a great size for suburban backyards. The large Workshop comes in a variety of colours to choose from so you can match it to your home. It also provides a large double door entry for getting your tools and equipment in and out easily. It has a gable roof which is essential for extra head room if you are going to be in there a fair bit. Extend the wall height from the standard 1.8m to 2.1m (Very popular). Add some accessories to improve organisation in your workshop. Add a window or skylight to light improve visibility inside. Change the hinged doors to sliding doors, great for narrow spaces. EasySheds are Australian Made and meet Australian Safety Standards. It is also designed to endure the harshest weather elements (as long as it is anchored accordingly). This EasyShed comes flat packed with the DIY instructions. We also provide assembly videos to assist you with the process.